← Eat, Fast and Live Longer. A 5-2 Fast Day Recipe Idea Under 200 Calories. Charred Watermelon With Chilli, Lime, Mint and Feta. There’s a lot of mystery surrounding the perfect panna cotta. A traditional Italian dessert literally translating as “cooked cream” it consists simply of sweetened milk and cream, held together with a little bit of gelatin. The defining hallmark of a well made panna cotta is most definitely its wobble. Not too firm to render it rubbery, not too soft that it falls apart. As Matt Preston once famously put it in a long ago aired episode of Masterchef “the perfect panna cotta should wobble deliciously like a rubenesque woman on 5 inch heels”. An aptly amusing, if perhaps not strictly politically correct, analogy that most definitely makes me smile. Like Goldilocks, it seems the secret to achieving wobbly panna cotta perfection lies in using just the right amount of gelatin. And so it is that I spent a pleasant afternoon experimenting in the kitchen with a box of gelatin and in the absence of any cream in my refrigerator and far too lazy to take a trip to the nearest store, cartons of milk and tubs of Greek yoghurt. Fortunately, making yoghurt panna cotta is a quick and easy process. Dissolve a little gelatin in cold water until it blooms, add to barely heated milk, then stir through yoghurt sweetened with a little honey and flavoured with vanilla. It’s the setting that takes time and discerns the quality of the wobble – up to 24 hours depending on the quantities made and depth and size of the moulds used. One important take-out, from those hours spent messing around in the kitchen, is for a smooth and velvety finish, anywhere between 1 1/2 to 2 teaspoons of powdered gelatin to 2 cups of dairy seems to do the trick. Dependent, of course, upon the creaminess and thickness of the yoghurt used. The safest, fool proof option is to set the panna cotta in half cup servings in clear glass tumblers. No unmoulding required. Definitely use 2 teaspoons of gelatin if unmoulding is a prerogative. There is nothing more ego deflating than watching a seemingly perfectly released pannacotta slowly disintegrate into a quivering puddle on a plate. With copious quantities of variously set pannacotta in the fridge we’ve been enjoying it for breakfast. Served with gloriously sweet grilled Bethonga pineapple, currently making a welcome appearance at the markets, and garden fresh home grown mint. Dessert for breakfast? In my books it’s a deliciously refreshing yet healthy start to the day. 4 slices pineapples, lightly charred and seared over a hot griddle pan or grill and sliced into wedges. SPRINKLE gelatin over two tablespoons of water in a small glass or bowl. Set aside to bloom and soften for ten minutes, without stirring. MEANWHILE pour milk into a small saucepan, bring to a bare simmer over medium-low heat. Do not allow the milk to boil. REMOVE saucepan from heat. Whisk through softened gelatin, stirring continuously until completely dissolved. Set aside to cool until lukewarm for ten or so minutes. This helps prevent any curdling when the mixture is added to the yoghurt. SPOON yoghurt into a medium bowl and whisk until light and smooth. Gradually whisk in milk mixture, honey and vanilla. POUR into half cup moulds or glasses, cover with gladwrap and refrigerate until set. Setting time will depend on the size and depth of the moulds or glasses used, a minimum of four hours for half cup set but overnight is best. If setting the panna cotta in one large mould or dish, allow a minimum of eight hours. After 24 hours the gelatin will not set any further. IF UNMOULDING pannacotta, run a non-serrated knife gently around the rim to break the seal, place a serving plate on top and invert. Otherwise serve directly from the glasses. GARNISH with grilled pineapple and fresh mint. 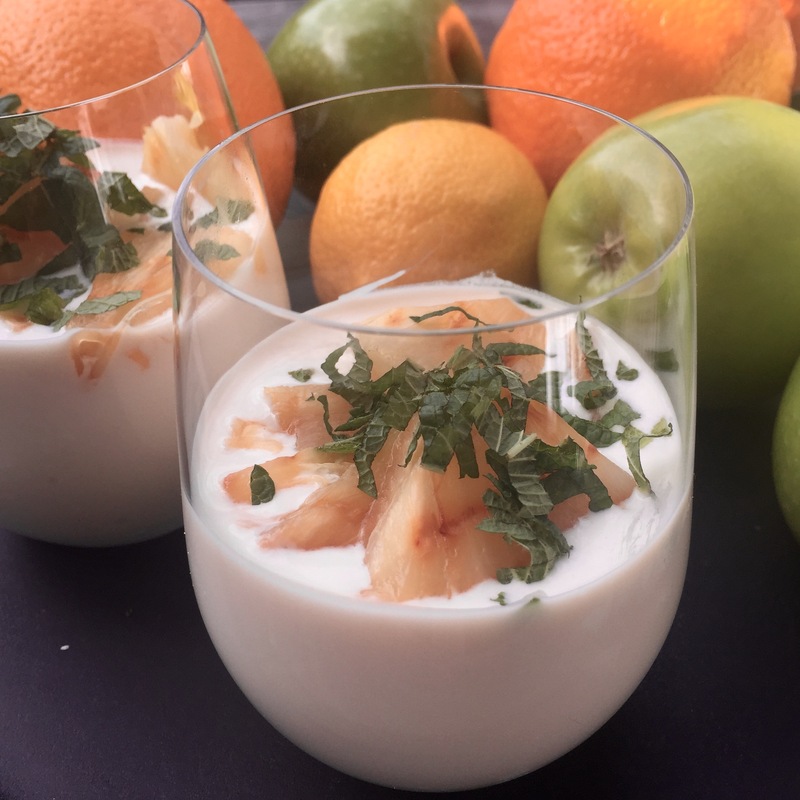 This entry was posted in Breakfast, Fruit, Sweet Treats, What I Love to Cook and tagged Breakfast, Brunch, Dessert, Gluten free, Healthy, Made From Scratch, Mint, Pannacotta, Pineapple, Yoghurt. Bookmark the permalink. 2 Responses to Dessert For Breakfast. Yoghurt Panna Cotta with Grilled Pineapple and Mint.